As expected the euro moved towards the downside, reached our first target, and exceeded it by 8 pips, before immediately reversing in a sudden rally to almost test the previous short-term high. EURUSD is expected to find support between 1.1178 and 1.1164, while remaining above 1.1135. Elliott Wave chart analysis for the EURUSD for 21st September, 2016. Please click on the charts below to enlarge. 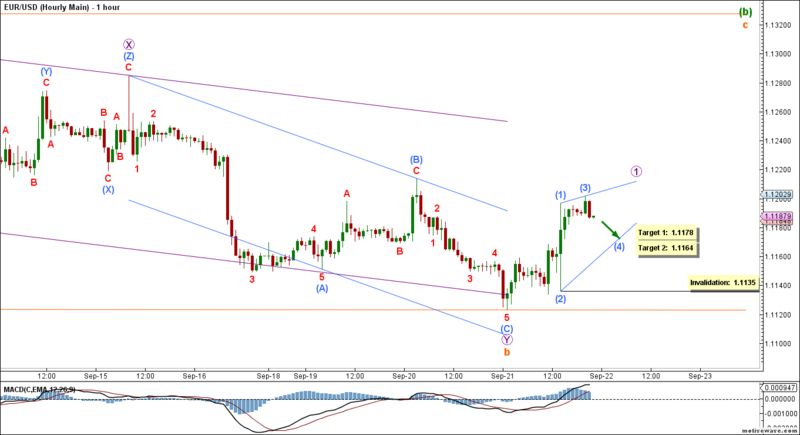 This main count sees that orange wave b is complete and that orange wave c is unfolding towards the upside. Orange wave bformed a double zigzag labeled violet waves W, X and Y.
Orange wave c is forming an impulse labeled violet waves 1 through 5. Within it, violet wave 1 is likely forming a leading diagonal labeled aqua waves (1) through (5). This may seem like a strange labeling on the hourly chart, but its details become much clearer on a 15- or 5-minute chart (which is beyond the scope of this medium-degree analysis). Within it, aqua waves (1), (2) and (3) are complete. 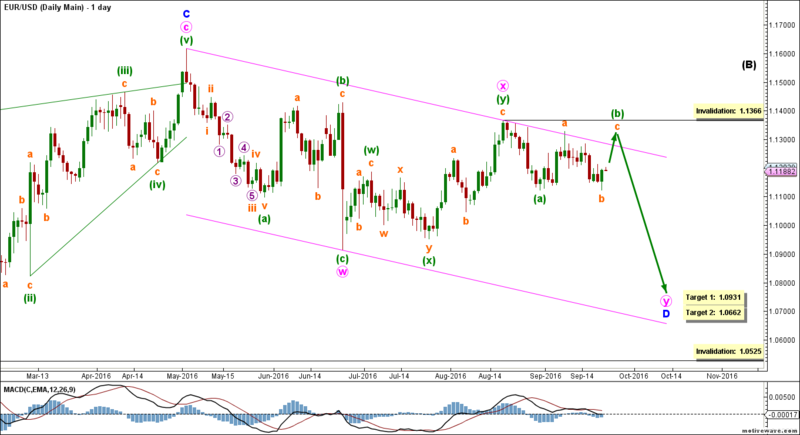 This count expects the euro to move towards the downside in aqua wave (4). At 1.1178 aqua wave (4) would reach 38.2% the length of aqua wave (2), then at 1.1164 it would reach 61.8% of its length. 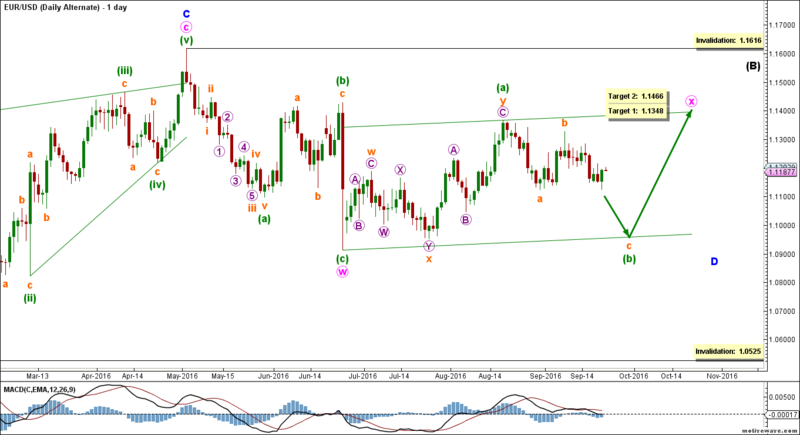 This wave count is invalidated by movement below 1.1123 as aqua wave (4) may not move beyond the start of aqua wave (3). Things are moving fast overnight & this early morning – to the upside, even without reaching 1st target for submicro (4). Looks very impulsive to the upside. Would be happy to hearing from you what you morning take would be :o) Thanks! Sorry for the late reply, I was swamped all day long and never had time to read your comment until just now.